Thanks to Dave Bell for pictures and names of aircraft and crew. 1/Lt John S. Disosway (Pilot) transferred to Crew #3906 (replacement). Disosway was replaced by 1/Lt Gerald K. Kunkle. Kunkle was replaced by Cpt Richard E. Scanlan. Cpl Robert F. Fei (Radio) was replaced by S/Sgt Joseph F. Cameron. Cpl Alvin H. L. Howell (CFC) was replaced by T/Sgt Ralph B. Kennerly . 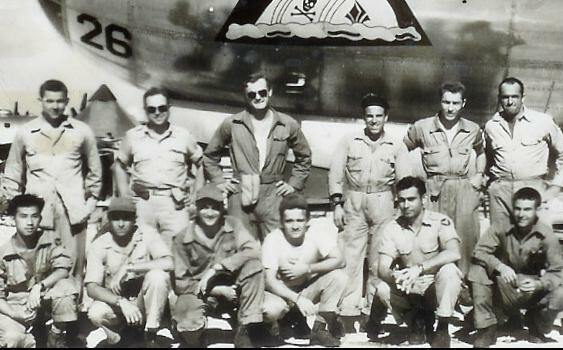 Kneeling - Left to Right: S/Sgt Euclid Chu (Radarman), 1/Lt Donald E. Johnson (Navigator), S/Sgt Joseph F. Cameron (Radio), Sgt Raymond F. Casella (T Gunner), 1/Lt Max J. Friermood (Bombardier), Sgt James M. Mugridge (L Gunner). This crew generally flew "Tokyo Trolley II".